In the current context of extreme instability and volatility in the Central African Republic where the United Nations local presence has even reported ‘chronical violence targeted at civilians’; the Central African Republic government has approved a strategy which aims to demilitarise the country’s penitentiary system. On 9 January 2019, Prime Minister Simplice Sarandji endorsed three policy documents targeted at reforming the judiciary sector. The first of the policy documents concerned a holistic reform strategy for the judiciary, the second included a strategy focused on health issues in the penitentiary system, and the third addressed a strategy for the demilitarisation of the country’s penitentiary system. The crisis which has faced the country over the past year has particularly affected the judiciary. The budget for the Ministry of Justice represents just over 1% of the national budget. Furthermore, jurisdictions in the east of the country are not functional anymore, given the presence of armed groups. Consequently, the country’s judiciary institutions suffer critically, and the penitentiary administration faces serious challenges. In May 2016, with the support of the European Union; the United Nations, the World Bank, and the government of the Central African Republic adopted its Plan National de Relèvement et de Consolidation de la Paix, for the period of 2017-2021. 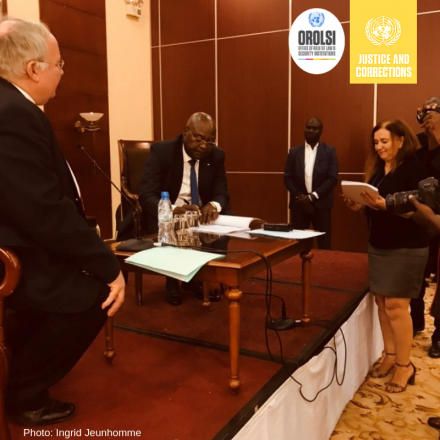 Within the framework of implementing the Plan, Penal Reform International (PRI) supported the Central African Republic government in developing an overarching strategy to address the deficiencies in the country’s penitentiary system. These deficiencies had meant that detention facilities did not meet the international minimal standards for conditions of detention. For example, in October 2018, the number of detainees in the country was 1,423 in eight different prisons. This meant that the detention facilities were overcrowded by a staggering 200%. ‘Nobody disputes that today’s detention conditions lead to violations of the principle of human dignity’, observed PRI’s Executive Director Florian Irminger, after a recent mission in Central African Republic alongside Haitham Shibli, PRI’s Deputy Director in the Middle East and North Africa region. As stated in the demilitarisation strategy, ‘the country faces structural violence in detention facilities and significant abuses of the rights of detainees, including the most vulnerable such as women and children,’ Florian further elaborated. One particularity in the country is that the surveillance and security duties of penitentiary facilities are held by the country’s armed forces (Forces armées centrafricaines, FACA) and its special forces (Forces de Sécurité Interne, FSI). As asserted in the strategy adopted by the government, demilitarisation of the penitentiary system in the country must lead to a significant structural change in order to address the systemic issues leading to human rights violations of individuals in detention.‘We applaud the government’s willingness to address the major deficiencies of the penitentiary system in the country, whilst also recognising the major challenges faced by the country,’ commented Florian Irminger. The government of the Central African Republic has now set forth plans to secure detention facilities by adopting the proposed demilitarisation strategy, and to adopt a program of progressive reforms of both the penitentiary sub-sector as well as the judiciary. 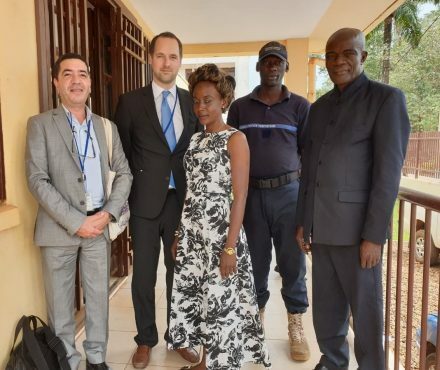 PRI is indeed committed to continue engaging in work in the Central African Republic alongside the United Nations’ stabilisation mission in Central African Republic (MINUSCA), and in support of the government’s penitentiary services.